When it comes to the cost of raising my two (now rather large) bundles of joy, I have tended to stick with micro-level calculations: Can we afford to send the kids to camp? How do we pay for those braces? Does she have to have a tutu to go to dance class? (The answer was, of course, a foot-stomping yes.) I tried not to think about the big picture. Too overwhelming. Nonetheless, for years I’ve heard it said that it costs roughly $160,000 to raise a child from infancy to age 18. Turns out that much-cited figure was originally compiled by Manitoba Agriculture — the actual number for 2004 (the latest year for which the calculation was completed) was $166,972 for a boy and $166,549 for a girl, predicated on the idea that the food cost for boys is higher. But how realistic is that? Does it take into account daycare costs? Orthodontics? RESPs? Extra-curricular activities? Or a bigger house to accommodate the rug rats? Let’s face it, no set figure can ever really sum up the myriad decisions parents make regarding the care and feeding of their offspring. And really, no one is suggesting that you sit down with a calculator and do a cost/benefit analysis on whether to pull the goalie. But just for interest’s sake (and so you can use it as ammunition with your kids), I teamed up with top demographer Roger Sauvé at People Patterns Consulting in an attempt to break down the costs of everything from nappies to Nutella. 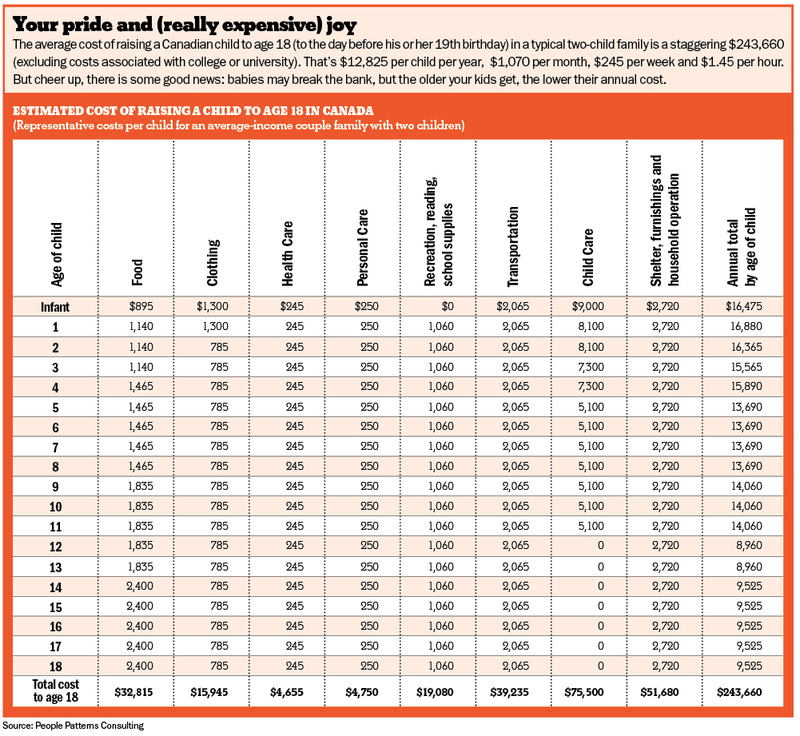 After two months spent knee-deep in reams of Statistics Canada data, we’re proud to announce that we’ve come up with what we believe to be the most comprehensive and accurate estimate of the average cost of raising a Canadian child to age 18 ever published. (To be accurate, it’s the cost of raising a child to the day before his or her 19th birthday, as is the Manitoba Agriculture figure.) Our goal is nothing less than to become Canada’s new official source for the cost of raising kids. After all, someone has to pick up the baton now that Manitoba’s ministry of agriculture has stopped updating its figures. Before we get started though, let us just point out that the Manitoba number was specific to Winnipeg. It took in food, clothing, health care, personal care, recreation and school supplies, transportation, childcare and finally shelter, furnishings and household operations. We’ve stuck with the same basic categories, but our research is more thorough, and our numbers reflect the average cost per child for middle-class couples with two children across the country, not just for Winnipeg. Still, it’s important to note that all these costs can be considered merely “rough estimates,” says Sauvé. 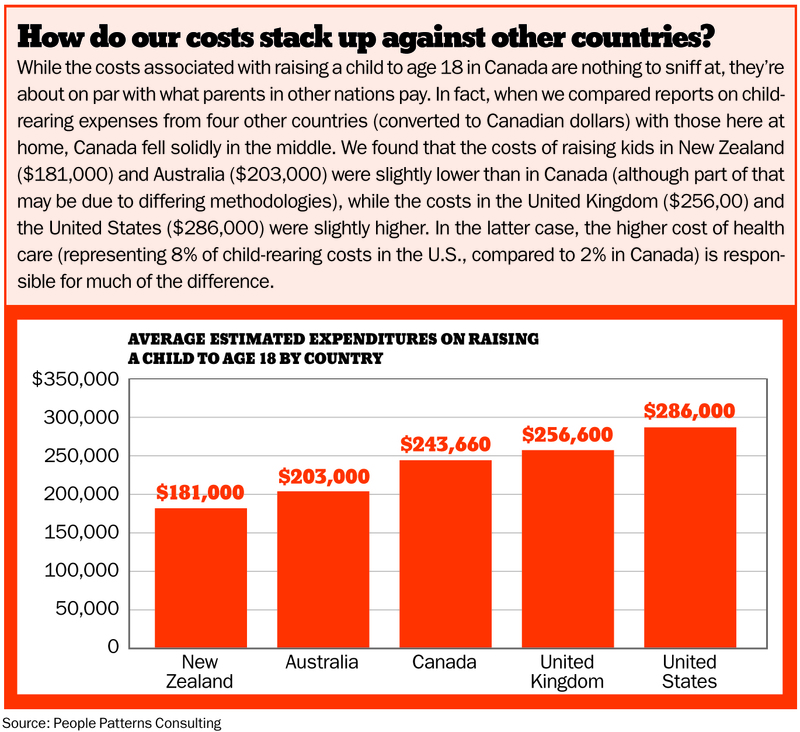 We looked at the average cost of raising a child in Canada. Very few Canadians will find they are spending exactly the average, just as very few Canadians make exactly the average income. A wealthy two-parent couple will no doubt spend more than our figure, and a money-conscious single parent will likely spend less. 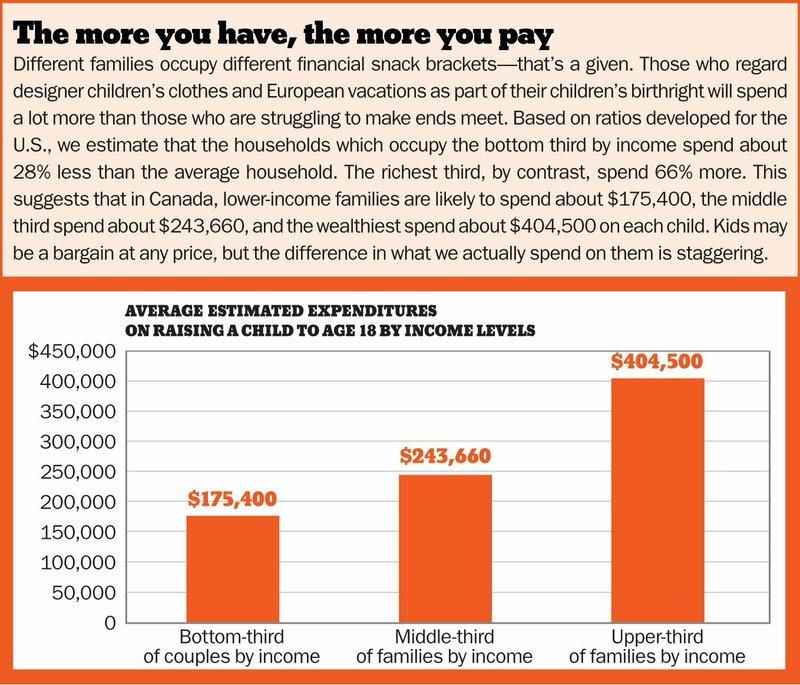 Studies also indicate that the more children you have, the less you spend on each one of them (see Cheaper by the dozen) and the amount spent will vary from province to province and by the size of the city you live in. There’s a bit of dumb luck involved too. After all, some kids need braces and tutors, and others don’t. Those caveats aside, read on for the results of MoneySense’s exclusive research into the real cost of raising kids from infancy to 18. The cost of feeding an infant did indeed start out small, totalling just $900 a year for boys in their first year of life and $888 for girls. “We assumed that the babies ate half as much baby food as a one-year-old and added an extra $27 per month for the additional cost of nourishing a breast-feeding mother,” says Sauvé. His data didn’t account for the cost of bottle-feeding babies, in which case you can slap another $375 to $2,000 onto your food bill for six months worth of formula. That estimate comes from a four-year-old study by breast-feeding advocacy group InFact Canada, and the variation in cost depends on the type of formula and where you live in Canada. As any parent will know, those early food costs rise steadily through the years. By the time your child is toddling about the kitchen cooing for juice, the average yearly food cost is $1,140. By school age, you’re paying $1,465 annually and a pre-teen is setting you back $1,835 per year. But that all pales in comparison to the $2,400 cost per year of feeding a ravenous teen. And believe me when I tell you that you won’t just be feeding your own. My 17-year-old son Ben and his buddies can clean out a kitchen faster than a swarm of hungry locusts can scour clean a barley field. On average, Sauvé estimates that it costs an additional $5,600 to feed a boy to age 19 than a girl, but the overall average for both girls and boys is $32,815. That number doesn’t take into account restaurant meals and snacks. Although, given that most kids can spot a set of golden arches from several kilometres away, maybe it should. An additional $515 per year was tacked on to the clothing expenses of children up to age two for diapers, for a total annual cost of $1,300 all in. Let me just add that, in some cases, it may be a little optimistic to expect a child to be out of diapers by age two. I still recall the daycare teachers coaxing a two-and-a-half-year-old Ben to “pee pee in the potty” so that he could move up to the “big boy” room. It was a blandishment that worked not at all. In the end, we resorted to that old standby: Smarties. One for each successful sit. Worked like a charm. The same StatsCan household spending report that provided the clothing estimates was also responsible for our estimates of health-care costs, including dental services, eye care and health insurance premiums. By comparing health-care costs for couples without children to costs for couples with children, we came up with a cost per family. As in the case of clothing, we then divided that cost by two, since most of the couples involved had two kids. Now keep in mind that this is the typical total cost. The actual amount you spend could vary by quite a bit, depending on the level of care you want for your kids, their general state of health and, yes, orthodontics. Should your little grinner need braces, you can count on a minimum of $4,500 (I speak from personal experience), actually probably closer to $7,500. Enough to ensure that you — his parent — will likely enjoy a stimulating second career as a Walmart greeter. On top of that, there’s the bill for prescription and non-prescription drugs, assorted specialists (chiropractors, psychologists, physiotherapists) and medical equipment (casts, eyeglasses, lost eyeglasses, broken eyeglasses). A quick scan of my income tax statements (health care expenses are at least a write-off!) shows an average of $1,500 per year over the last five years — at least half of that for the kids. That said, a workplace benefits plan covers most of these expenses, so our estimate of $245 per year, or $4,655 per child until age 19, is more likely to jive with your experience if you’re covered. Okay, I was initially baffled by this number. Our source again is the StatsCan study of household spending. And once more, we’ve taken the spending difference between couples with children and those without, then divided those expenses in half, assuming there are two children. The projected yearly cost: $250. Here’s the thing though: that’s a mere $20 a month. Anyone who has ever tried to keep a newly ripe young male in deodorant and a female in — well, I couldn’t possibly list all the necessary accoutrements — will know that $20 per month is really quite appallingly low. When I think back, however, the years that fell between diaper rashes and zits were blessedly cheap — save for the odd lice outbreak (when I’d break the bank on RID and go foraging in my kids’ hair with the obsessive energy of a manic monkey grooming its young). So while $250 a year is a reasonable overall average, be prepared to spend less in the pre-teen years, and quite a lot more after that. Let us just first mention that the StatsCan survey on which this number is based assumes that kids attend public school — not private — although that should be obvious from the total yearly expenses for recreation and school of $1,060. Of that total, $855 per year goes to recreation, including games, entertainment equipment and musical stuff, as it is a sad truth that it frequently costs more to amuse a child today than it once did to educate its parent. I confess that my husband and I bought into the whole extra-curricular run-around whole hog. So much so that my daughter Carly (the first-born) burned out at the tender age of five. Apart from the three days a week she spent in daycare, I’d enrolled her in ballet, gymnastics and ice-skating. When I took her for her skating lesson and she resorted to sliding around on her knees for the duration, I finally got the message and scaled back. That didn’t stop us, however, from testing out an array of paid activities over the years, among them guitar, piano, karate, hockey, tennis and even Hebrew Heritage classes (we’re not Jewish, but several of Carly’s friends were going — besides, I think they were free!). It was, perhaps, fortunate for us that our kids showed no discernible talent for any of these things. My heart goes out to hockey parents. But I digress. On top of the $855 for recreation we’ve estimated a total of $83 per year for school supplies and another $122.50 per year for other school-related expenses, including textbooks. I don’t recall paying for textbooks in elementary and secondary school (unless my kids lost them), but we always considered cash spent on Captain Underpants to be an investment in the future. In addition, there were assorted fees for school trips/fund-raising/feeding the classroom bunny and so forth. It is no accident that the universal symbol of parenthood is the minivan. From the moment the fat lady screams, so to speak, you can wave goodbye to the Smart Car and say hello to the four-door with the big trunk. Let us not forget that a larger vehicle means more money spent on gas and insurance as well. In addition to these hard costs, as your kids grow, you will no doubt be spending a great deal of time ferrying them around to various play-dates/activities/family visits. Even in the surly teenage years they frequently require a chauffeur, thus prompting the ever-resonant title of clinical psychologist Anthony E. Wolf’s parent survival guide, Get Out of My Life: but first could you drive me and Cheryl to the mall? In total, StatsCan data show a difference in transportation expenditures of $2,065 per year between childless couples and those with kids. Apart from the extra expenses associated with buying a vehicle big enough to accommodate the whole family, at some point, the rug rats generally want their own magic carpet. In Toronto, where I live, kids tend to rely on public transit ($99 per month or about $1,200 per year for a student pass). Not so for my friends in less-citified areas of the country, whose kids seem to be chomping at the bit to get behind the wheel as soon as the clock strikes midnight on their 16th birthdays. May I just say: ch-ching, ch-ching! Shelter costs in this category are based on the difference in price between renting a one-bedroom and a two-bedroom apartment in the Ottawa area (the difference adds up to a total of $2,064 per year). That said, the fact is, the birth of a child often brings out an as-yet-unrecognized yearning in parents for a house with a white picket fence and a yard with a swing set. With the average home in Canada selling for $365,200 as of Feb. 2011, it’s likely that is less than many of us pay. On a positive note, though, at least a home is an asset that tends to grow in value. (Unlike furniture … particularly when the kids have had the use of it.) Which brings me to the next item in this category: household furnishings and equipment. Let me just say that for most new parents, probably the first financial hit you will take is the cost of equipping your baby’s room. Crib and baby swing, ch-ching. Change table and nursing chair, ch-ching. Trendy mobile intended to stimulate infant’s attention and hence inner genius, ch-ching. This is only the beginning. As your child progresses through the years, you will no doubt invest in a desk and chair, which your son or daughter will studiously avoid using; a frilly little girl’s room that will suddenly be far too unsophisticated for the teen who seems to replace her overnight; and finally, when you’ve held off as long as is humanly possible, you’ll be stuck footing the bill for a cell phone (because realistically, how else will your teen get the attention of the friend sitting beside him in the coffee shop?). Add to that the additional charges for window-repairing, rug-cleaning, and repetitive strain injuries to the hinges on the cupboards and fridge door, and well, you get the picture. That $210 per year per child figure for furnishings and equipment is by no means inflated. Ditto for the total of $445 per year additional for household operations, including water, fuel and electricity ($330); household cleaning supplies ($60) and paper, plastic, and foil household supplies ($55). Seems a bargain, given the consumption patterns my two exhibit. I always think there’s a disconnect between my budding environmentalist’s strident declaration that we should install solar panels on our home and her seeming inability to notice that she has left the lights on. Yet again. We start off by making the assumption that you have, indeed, opted to have someone else care for your child for some duration. This seems a safe bet since 2009 stats indicate that fewer than one in five two-parent families have a stay-at-home parent. Even if you do choose to have one parent leave work to take care of the kid(s), this can hardly be regarded as a cost-free option. Recent research from TD Bank indicates that, quite apart from the wages you miss out on when you step out of the work force to raise children, you tend to experience a wage loss of about 3% for each year that you’re away. So if you take five years off, you’re likely to make about 15% less when you return to work; a wage gap that lingers for about four years. So, assuming you’ve opted for the admittedly crazy-making rush of the working parent, how much is it costing for daycare? 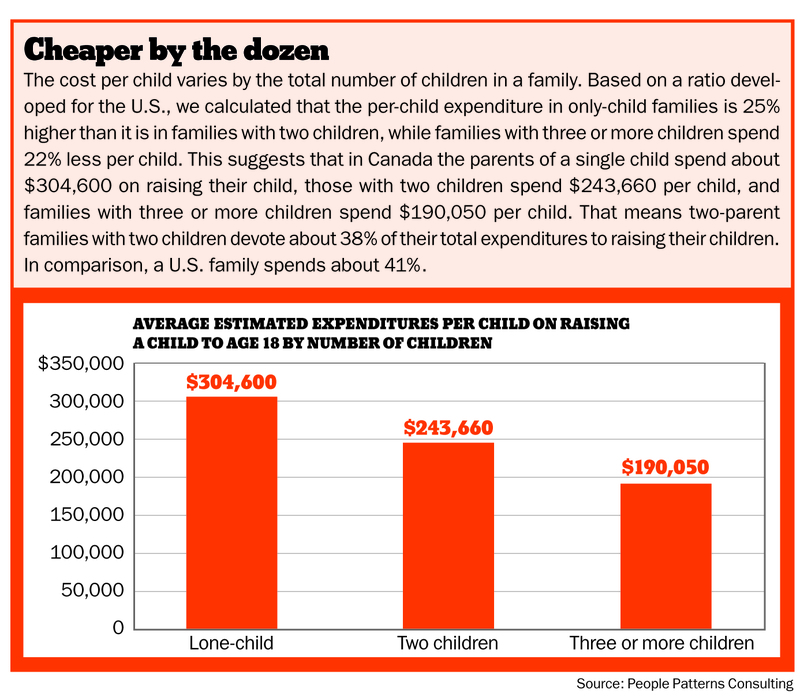 To come up with an estimate, we consulted a Today’s Parent magazine article by John Hoffman which attempted to quantify the cost of unsubsidized daycare across the country. The average of $9,000 per year for an infant to $5,100 annually for school-agers may or may not reflect your personal experience. Perhaps you’ve been lucky and a willing grandmother helped take care of your kids. Or maybe, like me, you opted to put them in daycare part-time and work around their schedule. On the other hand, you may have broken the bank to hire a live-in nanny. If our number seems wildly deviant, why not do the math and plug in your own? I know, I know, you’re flabbergasted. Me too. But when we added up all of the expenses we arrived at $243,660 as the total cost of raising a typical child to age 18 (in other words, until the day before his or her 19th birthday). That’s $12,825 per child per year or $1,070 per month. Good lord, that’s $1.45 for every hour that your child is alive. But although our total is considerably higher than the Manitoba Agriculture figure, we believe it more fairly represents what the average family spends across the country. If anything, as I noted, I found that some of the costs we calculated were a little low. When I happened to mention this massive $243,660 sum to my daughter — now 20 and costing us a pretty penny at university in Montreal — she said flatly: “But I bet that’s based on parents who are nicer than you — I bet those kids got more than 50 cents per year for allowance.” (It’s true, but it was a formula I came up with to sell the benefits of a part-time job — which worked.) “There was no specific category for allowance,” I responded. Nor was the full cost of birthday parties, presents, family vacations and parent-child bonding sessions over outrageously priced pseudo-coffee drinks specifically represented. As for post-secondary education (without which, how will our beloved offspring expand their minds and learn to drink beer without grimacing?) we left that out too. That said, if you plan to spring for the full cost of a university education for your children, as of 2010, you can count on anywhere from $20,000 (for the student who lives at home) to about $64,000 (if they live away) for a four-year degree. If you’ve just given birth, that number rises to $37,100 (live-at-home student) to $137,000 (live-away student) in about 18 years time, after inflation, according to a TD Bank report from 2009. We didn’t attempt to attach a value to the hidden costs of parenting either — the countless hours spent bathing, burping, diapering, disciplining, chauffeuring, teaching, amusing and simply supervising kids. Says Sauvé: “That would be almost impossible.” Frankly, if we did, we’d be afraid of putting MoneySense readers off having kids at all. Of course, there are some financial benefits associated with having kids too. They can help you reap some tax savings and credits. And, judging from my own experience, families with children are apt to spend a lot less on things like wining and dining, movies, theatre, and weekend trips to Paris, largely because — at least when the kids are little — we have no life. Expenditures for pet care, jewelry, watches and package travel tours, not to mention cigarettes, booze and gambling are also higher for childless couples according to StatsCan. Small wonder one of Sauvé’s child-free friends was left pondering where the $487,000 he had “supposedly saved by not having two kids” had gone. I would also point out that eventually your children will have their uses. I’d like to be able to say that, in return for the many years I’ve spent caring for my kids, I’ve been able to rely on their selfless help around the house. But I’d be lying. Unfortunately, their idea of multitasking is wolfing down a Pizza Pop while checking their Facebook account. That said, I might never have learned to text without Carly’s encouragement (“Mom, when were you born anyway? How can you not know this stuff?”). And Ben can master an electronic television menu with the speed and dexterity of a skilled surgeon. If it wasn’t for his assistance, I’d probably still be watching the same solitary channel on the TV. In the end, though, the rationale for having kids isn’t rational at all — it’s emotional. Perhaps I veer too close to the maudlin, but I wouldn’t change the fact of my children’s birth for anything. From the moment I inhaled their new baby smell, I was hooked, and they’ve been the source of much joy (and a fair bit of anxiety) ever since. In summary: Cost of raising a child to age 18: $243,660. Watching your kids grow into (somewhat normal) human beings: priceless.